Social, relationship and intellectual capital encompasses our relationships with communities, groups of stakeholders and other networks and promotion of innovative thinking. It incorporates shared values and behaviours and provides us with our social licence to operate. Interaction with key stakeholders, consideration of their concerns and earning their trust are central to maintaining and developing this capital. Hulamin recognises that in order to create sustainable value for all, it needs to be responsive to all stakeholder expectations. To meet these expectations it is crucial to build trust and respect with our stakeholders since this will impact positively on our reputation allowing us to engage proactively on issues of mutual interest. – benefits associated to the aluminium value chain for local development in terms of beneficiary electricity. Shareholders, investment community, creditors and lenders who provide us with the financial capital required to sustain our growth. This is covered in detail under the Financial capital section here. We are reliant on customers and potential customers to sustain revenue generation and growth. The majority of our sales are to export customers. We are focused on growing the local and regional markets This is covered in detail in various sections of this report, such as here. Suppliers of metal and other products and service providers are important as we are reliant on them to provide safe, good quality and good value products and reliable services that support growth. Employees are the key underpin to achieve operational performance and objectives. This is covered in detail under the Human capital section on here. We build and nurture existing relationships, and create a conduit to better understand community needs and interests. This allows for us to contribute to transformation, enterprise development and various corporate social investment initiatives. Recently, Hulamin realigned its CSI policy to invest in fewer, but more substantial projects, with particular focus on historically disadvantaged communities, as it is imperative to make a difference by adding value to the development of these communities. The organisation’s CSI programme focuses primarily on education, health, development of community skills, welfare, environment and crime prevention. Hulamin’s Enterprise Development objective is to facilitate the development of sustainable businesses that will create jobs and add stimulus to the economy. Hulamin is committed to this process by providing business opportunities to new enterprises and support for Small, Medium and Micro Enterprises (SMMEs) through the provision of professional, financial and logistical support as well as various start-up support services. An important element is the emphasis on the value chain, where Hulamin has influence to create opportunities for new businesses as customers or suppliers. The Department of Trade and Industries has set out a target of at least 3% of the net profit after tax to be spent on economic development. We have continued to meet and exceed this target. Today, innovation performance is a crucial determinant of competitiveness and national progress. Moreover, innovation is important to help address global challenges, such as climate change and sustainable development. At Hulamin, we strive for innovation in order to provide the best quality product for our customers, promote economic development and develop future innovators and leaders. Hulamin and South 32 collaborated to form the Aluminium Beneficiation Initiative (ABI), an economic development initiative focused on developing and supporting high level entrepreneurs in aluminium fabrication or beneficiation. A key objective of the ABI is to grow local market usage of aluminium. This will have a positive impact on the local economy by promoting job creation and providing an opportunity for skills transfer. The mission is to identify and support 100 entrepreneurs in the aluminium fabrication sector and guide them into sustainable businesses within three years, which will result in these businesses consuming at least 100 tons of aluminium each. The aluminium industry in South Africa currently exports large volumes of un-beneficiated material whilst at the same time imports finished products. Through ABI, the plan is to promote a business model for industry that will encourage local sales through significant beneficiation or value-add. In 2015, ABI engaged over 1 000 business people/entrepreneurs country wide from which 102 entrepreneurs were identified and approved as part of the ABI programme. Of these entrepreneurs 55% are black (Africans, Indians and Coloured). The Small Enterprise Financial Agency (SEFA) has partnered with ABI and have earmarked a R100 million fund split as follows: R80 million dedicated exclusively for aluminium projects and R20 million earmarked for Hulamin and South 32 contractors to use for their business expansion and growth. 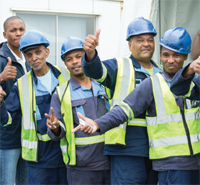 Of the above fund, nearly R10 million had been disbursed by end December 2015 resulting in the establishment of two factories, one located in Durban, producing skid covers for Hulamin packaging requirements and the other in Pietermaritzburg, distributing and warehousing aluminium to smaller fabricators in KwaZulu-Natal. 22 direct jobs were created from the disbursed funds to-date. ABI has established a number of strategic partners in the market place such as the Aluminium Federation of South Africa (AFSA) and the Western Cape Economic Development and Business Chambers. As a South African manufacturer, Hulamin’s strategy is closely aligned with the industrialisation and beneficiation objectives of the South African government. Hulamin is committed to the implementation and success of broad-based empowerment throughout the Group and has, over many years, implemented and maintained a number of initiatives relating to employment equity, skills development, preferential procurement, enterprise development and corporate social investment. Pursuant to these objectives, Hulamin announced a new BEE Transaction in 2014. A significant portion of the benefits of the BEE Transaction is intended to be spread among Hulamin’s Eligible Employees, which will include all eligible non-management employees and black management. The New Strategic Partners’ BEE Transaction has been designed to promote an improved likelihood of a reasonable level of vesting for Hulamin’s Strategic Black Partners, which includes a significant broad-based element, who, after investing R40 million in the Company in 2007, have participated in the Group for the past seven years and have committed to a further eight years by way of this transaction. The vesting potential of the New Strategic Partners’ BEE Transaction has been capped, limiting the portion of potential benefits of the overall BEE Transaction to these parties. On 22 December 2015, Hulamin concluded agreements with the “New Strategic” BEE partners to facilitate the acquisition of an equity interest in Hulamin. The BEE partners consist of Eligible Employees and long-standing Strategic Partners. On the same date, the ESOP Trust subscribed for A1 ordinary and A2 ordinary shares in the company. Under the scheme, participating employees are granted conditional awards linked to these A class shares. On the vesting of the award, the A class shares will be converted to ordinary shares in the company, which may be sold or retained by the employees. The scheme extends to all employees below management, and to black management. The new BEE Transaction will reinforce Hulamin’s reputation and commitment to the spirit of transformation and economic empowerment, sustain constructive labour relations as well as Hulamin’s relations with surrounding communities. Business relationships with companies who actively pursue sound employment equity and black economic empowerment programmes are encouraged in support of the economic empowerment of black South Africans. The future of the country and Hulamin are dependent on growing the economic involvement in mainstream business, on a sustainable basis, of all previously disadvantaged groups. Business will only be sustainable with the empowerment of black South Africans going forward. Our intervention programme of preferential procurement is meant to achieve these objectives. Over the last 12 months Hulamin spent more than R6,2 billion in total with B-BBEE enterprises. Of this total, R320 million was spent with Qualifying Small Enterprises (QSEs) and Emerging Micro Enterprises (EMEs), R312 million on black enterprises (greater than 50% black-owned), and R53 million with black woman-owned businesses (greater than 30% black woman-owned). 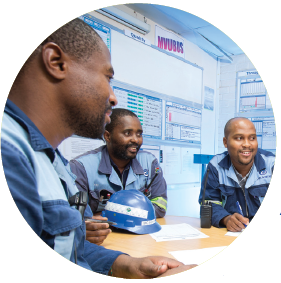 Hulamin met and exceeded our targeted spend of R60 million with wholly African-owned entities for 2015. See the online sustainability report for more detail on each of the aspects of social, relationship and intellectual capital.